Boy, has it been a while since I posted here! Think it’s time to revisit my personal development aspirations. It seems I posted most of the Personal Development blog content got posted in just three years: 2006, 2007 and 2008. Looking back, I realise these were the years of both searching and tremendous growth for me. I made a big career jump, my daughter was born in 2006 and average sleep time I’ve been getting was consisently under 5h per night. Did wonders to my blogging productivity, not just here but also on my technical blogs – Solaris Blog, Unix Tutorial , Perfect Blogger and Desktop Virtualization. Having found my next career challenge in mid 2010, I’ve been so busy that the habit of daily (or even monthly!) blogging went away. Planned like a brief pause in my blogging routine, this became a break of almost 10 years! A lot has happened since 2010! I lived and worked in Zurich, Switzerland for a couple of years and this changed my approach to work and life balance in a big way. It’s amazing how people manage to stay with just one or two employes for most of their working life in Switzerland – taking month-long (unpaid!) holidays and living very active lives. I came back to Dublin in 2014 and started my own technical consultancy – Tech Stack Solutions. I mostly work as a technical consultant these days. In 2015 my son was born and this has taken things to a whole new level, consistently keeping my beloved wife and myself busy, sleelpess and entertained by his energy and curiosity. Since 2018 I’ve been focusing on my Unix Tutorial blog – I even started Unix Tutorial group on Facebook and it’s slowly but steadly growing. Think I want to spend more time and energy sharing basics and teaching beginners, consulting and coaching. Busy as I am these days, I miss writing my thoughts down. That’s why I’ve been slowly getting back to blogging in the past year. I have spent 2018 reviewing technical blogs and centralising focus on the Unix Tutorial blog. I’d like to begin 2019 by reviewing this blog. It’s a very strange feeling – reading so much of the views and thoughts of my younger self, almost feels like meeting an old friend and catching up! So glad I took the time and energy to write back then! As you may know, I started another website in 2017: www.GlebReys.com. Rather than starting blogs on my hobbies like running, climbing, photography and reading, I decided to share thoughts on them on just one website – so that’s how the Gleb Reys website was born. Will 2019 be action packed? I’m sure. Is this going to be immediately reflected in blogging across all websites? I don’t know. Unix Tutorial will be the primary focus and so far it’s been fun – I even enjoy posting daily. Just wanted to take the time and start taking stock. It’s fun! It seems Nozbe 3 has really come a long way since I’ve spent some time evaluating it back in 2013. From the Nozbe 3 announcement blog post and video, it seems prime for another round of testing when I get time. Wonder if quick entry is improved as it was one of the biggest show stoppers for me. I couldn’t care less about the new and shiny logo, but think better project orientation and business plans are something that could be quite nice. projects can have roles now (Admin, User and Guest) – seems like a great idea! Overall, a very solid update for an already great product! Will be fun to give it a try sometime later in 2016. I’ve been pretty busy in the last few days simplifying everything around me. At home, I have sorted through a few shelves of old documents, carefully scanning some and storing or throwing away the rest. In my Evernote, I have sorted hundreds of old notes and files I no longer needed. I installed SimpleNote for my quick note taking while on the go. On my laptop, I have removed most of the icons from my desktop and task bar. I have uninstalled quite a few applications even on top of my regular cleanups. I got rid of some apps on my iPhone. I added a few too: SimpleNote for note taking on the go and Day One (which I have owned for quite some time) for taking daily notes. I changed WordPress theme for this and some other blogs. I tidied up sidebars so that they look much simpler and better. Listed like this, the last few days seem like one big spring cleaning. It’s crazy, but some days just seem to have their own purpose. You wake up and the plan is already in your mind. Steps of the plan may not be clear but the need to follow them is unbelievably strong and real.The need to act in a certain way and to reach some inner feeling of balance takes priority over most of your other plans for the day. You don’t always know why, but you take steps one after another until you get the feeling of accomplishment. And then you stop and notice the obvious: you have just made things much simpler. Again. I’ve been taking great interest in the DEVONthink suite of products lately, testing trials of different editions in my search of the perfect tool to start my paperless office. DEVONthink products are well known among Apple users as some of the most sophisticated and powerful tools available today. There’s quite a steep learning curve for most products but luckily great documentation is available as well as numerous how-to posts online. DEVONthink Personal is the easiest way to get started with two more editions available as advanced feature upgrades. Priced high enough, DEVONthink Personal costs around $50. However, just for the months of September (sadly, not the whole month but only until September 24th), it’s available with a 35% discount, making it a lot more attractive. 09/01/2016: this link isn’t available anymore but I’ll be sure to mention further specials when they become available. 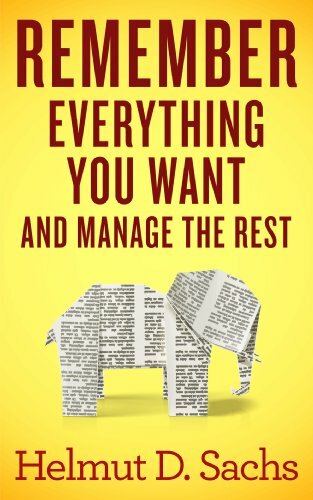 Hi everyone, I just got a tip from one of the readers that a really nice Kindle book – Remember Everything You Want and Manage the Rest – is free on Amazon this weekend. To be precise, it’s been on sale from Thursday and will back to its normal price some time this Saturday. I’ve been lucky to still get it for free so if you have spare two minutes – hurry up and do the same, reviews for the book are quite positive and it’s probably going to take you just a few clicks to download and a few hours max to read. I will read the book and post my review here. The ebook description is quite comprehensive but if you want even more info, please head to the official page of the book and read about its launch: Remember Everything – Book Launch. As much as I’d like to avoid posting about Nozbe my third post in a row, I feel I had spent enough time with the solution to share more findings with you. I’ve been using Nozbe for about 8 weeks now and have just paid for my first month of its use. I transferred my workflow and most of my tasks into Nozbe without much of a problem, but a few imperfections with the app kept me from paying for the whole year of service. Whether I’ll stay with Nozbe or not – I’m not sure, but I can already see that there are things I really like. There are things I really miss too, so it’s just going to be a decision of what’s more important – benefit of new features or disadvantage of not having some basic (in my view) functionality.